As a child growing up, one of the things my Italian father was known for was his amazing Italian sub sandwiches. Layers of meat, cheese, tomatoes, hot peppers and anything else that could fit went between those two layers of fresh bread. It is this type of passion for serving quality food which is appreciated by those who have either used a food slicer in the past, or are contemplating buying one for the first time. It doesn’t matter if you are the average home cook, chef or a food enthusiast – this review will help explain what the Chef’s Choice 667 International Professional Electric Food Slicer is about and if purchasing one is the right choice for you. Note: This review is my own opinion based on personal research and review. If there are changes I’ll update this page. I have done my best to give you all the information you need to make an educated decision for your purchase. Make sure when clicking through to the merchant, to confirm you are ordering the right product with the advertised features. Please note, this post may include links to Amazon for whom I am an affiliate. 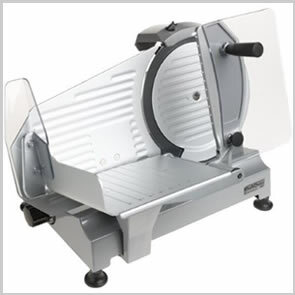 This slicer comes with a number of safety features – something appreciated by any operator. Interlocking On/Off Switch. For starters, it does not have a single on/off switch – it has two. The first switch will turn the slicer on, and the second switch makes the motor run. By having a double on/off switch, you do not need to worry about the blade automatically starting when you plug the food slicer in since it uses the second switch to start the motor. Blade Removal Tool. The third safety feature involves the blade. The 667 model comes with a blade removal tool which allows you to lift and remove the blade without actually touching the blade itself. It uses a guard which covers the blade edge so you can handle it easily and safely while cleaning. Blade Indicator Light. The 667 also comes with an indicator light which remains on while the blade is in use or spinning. Blade Guard Safety Switch. And finally, this slicer comes with a switch which prevents the blade from operating should the blade guard not be properly attached. Note: Make sure to read the owner’s manual in detail to ensure proper use and handling of this slicer. What arrives with the 667 Food Slicer? When you order the 667 Food Slicer, you will receive an owner’s manual which should be read from front to back. It includes a 10″ smooth edged commercial hard chromed stainless steel blade, and a food tray used for catching the food as it passes through the blade. What is the difference between the 662 and the 667? They look the same. They look the same because they are essentially the same design but different sizes. The 662 uses an 8″ blade while the 667 uses a 10″ blade. The larger the blade, the more heavy duty slicing can be achieved. The carriage sizes are both the same. The 662 comes with a blade sharpener, while the 667 has a built in sharpener. There is no difference in thickness adjustments. Both can slice from paper thin to 1/2″. The 662 is also less expensive, so if the 667 is not in your budget, definitely take a look at the Chefs Choice 662 at Amazon. How big is the 667? The 667 food/meat slicer measures 20.9″ in length, 14.6″ in width and 14.5″ in height. Check to see if you have the counter space, or at least a table station to use this machine. It weighs approximately 32 pounds, so make sure you can lift something of this weight. Some people choose to leave it in a stationary location on the kitchen counter, while others put it away after each use. The 662 model however, does not weigh much less coming in at 29 pounds and measures 19″ x 15″ x 13″. Not a huge difference in overall size, but it could be an important factor, considering the design and size of your kitchen. The 667 is made of die cast metal construction. Some cheaper models use quite a bit of plastic parts – such as the food carriage, however this one does not. It does use plastic for some of the knobs and smaller parts – most likely an attempt to help cut back on the weight. However, as mentioned, the carriage is made of stainless steel and uses industrial ball bearings for smooth movement. The blade cover is made with anodized aluminum which keeps friction low providing smooth slicing. And lastly, the feet are made of rubber which help keep the slicer stable during rigorous use. The included blade is a 10″, stainless steel, non-serrated blade. Many of the other models of Chef’s Choice food slicers include a serrated blade. However the 662 and the 667 contain non-serrated blades. You can however, purchase a serrated blade separately. The serrated blade is recommended for cutting courser, or uneven textured foods such as bread or fish, where a greater degree of gripping is required. However, some statements by previous owners suggest the serrated blade is not required, and recommend holding off on the purchase unless you are certain you will be using it. The 667 also includes a convenient built in blade sharpener which will sharpen the blade while it is still attached to the food slicer. This model slices from paper thin (such as for prosciutto) to 1/2″ thick (perfect for steaks). You can adjust the thickness by using an adjuster knob located on the machine. Using the thickness adjuster provides even and consistent slices each and every time. Does it only slice meats? No. In fact not only will it slice meats, but also fish, vegetables, fruits and breads. Common uses are for slicing ham, leg of lamb, beef, turkey ,fish (especially in Korean cooking), lettuce, cabbage, onions, potatoes, tomatoes, apples, peaches and well… pretty much anything you can think of. The cartridge for holding the food extends to 8 1/2″, therefore, make sure the length of meat does not extend beyond this. If the meat or fish is raw, the best way to slice it is to slightly freeze it for about 15 to 20 minutes. Thawed raw meat will not produce smooth slices. If the meat is already frozen solid, let it thaw a bit before use. Do not slice through meats which are still frozen solid. Do not try to use the slicer to cut through meat which still has the bone in it. When buying meat in bulk, cut off the portion you plan on using for the slicer, and freeze the rest – rather than slicing everything at once. If you are confident you want to slice everything first and then freeze it all – you might want to invest in a Foodsaver vacuum food sealer. These remove any air from the packaging and help extend the freshness and storage life. Do not slice through seeds in fruit, such as peaches. Tomatoes are okay. What is the Varitilt design? One of the nice features of this machine is the Varitilt design. This refers to the food carriage, in that it tilts at a 30 degree angle so the food placed on the carriage will easily slide towards the blade. This allows for an easier and more fluid movement when slicing, and prevents undue exertion. This has been one of the praised features of the 667. You would think a professional food slicer would be loud and noisy, yes? Not in this case. The 667 has a induction motor which runs quietly and smoothly. It has 180 watts of power and can exceed 1/4 horsepower at peak performance for heavier workloads. The motor stays cool, and can handle heavy use keeping the last slice as perfect as the first. Is the 667 food slicer easy to clean? Cleaning is fairly straight forward. For a thorough cleaning you will need to remove some of the parts and reassemble them when finished. The most common complaint is the time it takes to clean the slicer after each use. However, some users have found as long as they were not cutting juicy meat, they were able to clean the blade without removing the blade – using butter brushes or Q-tips as recommended by the manufacturer. When using raw meat, or meat which is juicy, it is definitely recommended to remove the appropriate pieces and clean thoroughly. It can take 10-15 minutes to dismantle, clean and reassemble properly. 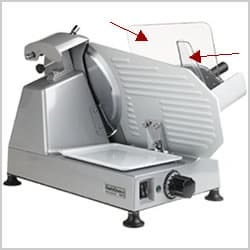 When purchasing a heavy duty food slicer like the 667, it should be expected to take the necessary steps to keep the machine in proper condition. Not cleaning sufficiently can lead to bacteria build up – this is obviously not a good thing. It is important regardless of the appliance, to keep kitchen equipment sanitized and free from bacteria. My husband and I tend to err on the side of clean and germ free environments, so for an appliance like this, it would be well worth the time taken to keep it clean. Even for a simple juicer, it is required to disassemble each piece in order to properly clean all the parts. It is no different with something as magnificent as this model. Can I clean the pieces in the dishwasher? Each part, including the blade and plastic parts must be washed by hand. This is common with home professional slicers. Where is this machine manufactured? At the time of this review Chef’s Choice manufactures the 667 food slicer in Italy. I find that Amazon consistently offers the best competitive prices. They also have excellent customer service and are always glad to assist you. If looking for a smaller version, try the 662 Chefs Choice Model.